Buford Betty: Iron Man, anyone? Snapping off lines as crisply as Bugs Bunny might bite into a carrot, the sculpture-bearded Downey invigorates the entire proceedings in a way no other actor ever has in this field. Well, duh. Because he's awesome. 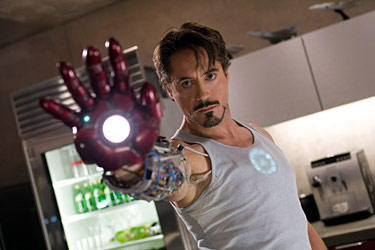 Maybe I've only mentioned it subtlely here, but I've been in love with RDJ since Weird Science. I'm pretty sure he secretly loves me too since I wrote him once while he was in jail. Oh yes, I did. Sent my picture too. Besides Alex P. Keaton, he is the only other celebrity I've ever written to in my life. Plus the Michael J. Fox one was a joint letter with a friend, so does that really count? Bestest thinks my love for Bob is totally nuts. But I don't know, he just does it for me. So I'm just over-the-moon thrilled for him to have this huge blockbuster coming out. It's a great comeback opportunity for him so I really hope it does well. Not sure if I'll make it this weekend, but Bob is definitely on the to-do list. And you can read that however you see fit. I'm soo jealous you wrote to MJF! I am totally with you on Alex P. Keaton...I have been in love with him since I was 5! I don't share your love of RDJ...but I can see it. I'm so glad you said it first b/c I'm always ashamed to admit my love for RDJ. My crush started when I saw Chances Are. After renting is a billion times, my dad told me I had to rent other movies so I starting watching anything with RDJ in it! Seriously you are CRA-ZY! Do you remember the "Bob dance?!" Tehe!! I certainly do, bestest. I tried to get it going here (with my frequent clubbing and all), but it never really caught on.